A popular modern religious system believes that at our Saviors first coming, the chosen people of Israel were offered Christ and the Kingdom of God, and totally rejected both. Due to this supposed complete rejection, the people of Israel were set aside in Gods purposes throughout the current age. Is this view accurate? Unto you therefore which believe he is precious... show forth the praises of him who hath called you out of darkness into his MARVELOUS light. Peter here refers to Old Testament prophecy in Exodus 19:6, where God calls Israel a kingdom of priests and a holy nation. it is Israel who is a royal priesthood and holy nation, Peter says. The apostle clearly confirms that prophecy was being fulfilled already in his day, wherein Israel was being called out of the darkness of unbelief into the light of Christ. In the same passage, the Apostle Peter pointed out, however, that Christ is also a stone of stumbling, and a rock of offense, even to them which stumble at the word, being disobedient: whereunto also they were appointed. (1 Peter 2:8) Christ was a stone of stumbling to some individuals among the Hebrews, although not to all. Peter had just spoken of Israelites who came to Christ, so this rejection could only be partial. Dr. Alva J. McClain, late President of Grace Theological Seminary says, FOR The unbelieving rejection of her Messianic King [was] by the authorized leaders of Israel. (The Greatness Of The Kingdom, p.357) Similarly, Dr. Andrew C. Zenos, late Dean of McCormick Theological Seminary, speaks of the apparent disaster threatening Him [i.e., Christ] personally in the intense and bitter hostility of the leaders. (Plastic Age Of the Gospel, p. 105) Christs kingdom was clearly a stone of stumbling to the nations leaders, contrasting with the favorable reception given to the gospel by large numbers of Israelites, as we will see. Everywhere Christ went in Israel, we read of the common people who eagerly followed and believed in Him, often in great numbers. For example, Matthew 19:2 says, Great multitudes followEd Him. Mark 10:1 says, Multitudes came together unto Him again. Yes, multitudes, not of the leaders, but of the common people followed Christ. So many Israelites followed their Savior, that Luke 11:29 tells us, The people were gathered thick together. How about that! Thick as molasses, the common people of Israel followed their Savior, Jesus Christ. Luke continues to tell us in chapter 14, verse 25, And there went great multitudes with Him. How many Israelites followed and believed in Christ? Great multitudes!!! Another interesting statement is made by Luke in chapter 12, verse 1: There were gathered together an innumerable multitude of people, insomuch that they trode one upon another. They stepped on one anothers feet to get to Christ! Notice that there was no room to walk because of the great multitudes of new believers; it was standing room only for Israelites following Christ! Scripture records that the Pharisees said to one another, Perceive ye how ye prevail nothing? Behold, the world is gone after Him. (John 12:17-19) From a vantage point in Israel of that day, it did indeed appear that the whole world, an innumerable multitude, had gone after Christ! Leading scholars are well aware of the fact that Israelites received their Savior in large numbers. Benjamin B. Warfield (1851-1921), respected Professor of Theology at Princeton Seminary commented, It is, perhaps, not always appreciated how great a popular excitement was roused when, as Mark puts it... Jesus came into Galilee...saying, The time is fulfilled, and the Kingdom of God is at hand. (1:14-15) It is not the fault of the Evangelists if it is not fully understood. (Christology And Criticism, p. 53) Yes, it is not the fault of the Gospel writers that mainstream theology today mistakenly thinks that all of Israel refused to believe. Yet, much of modern theology is based on the false view that Israel totally rejected her Messiah. Upon that foundation are built teachings that the church replaced Israel, and that we are now living in an interregnum, an unforeseen church age in which God is not dealing at all with Israel, but only with a completely different group of people called gentiles. Conversely, if it can be shown that any significant number of Israelites followed Jesus Christ, then the foundational pillar of modern dispensational theology completely crumbles. A popular view today assumes that by the collective act of weakness in denying their Savior at the crucifixion, the Israel people were actually totally rejecting Christ, and that virtually no Israelites outside of the Apostles expressed faith in Christ from that time on. Some will even state that God doesnt want Israel converted in this age; others say that it is not necessary because Jews are saved without Christ. This latter opinion, known as Dual-Covenant theology, proclaims Jewish salvation by race, and denies the basic salvation doctrine of the New Testament. (see Erwin J. Kolb, How To Respond To Judaism, p. 7, 24) These un-Scriptural teachings are built upon the mistaken notions that all of Israel rejected Christ, and that the modern Jews constitute all of Israels descendants. 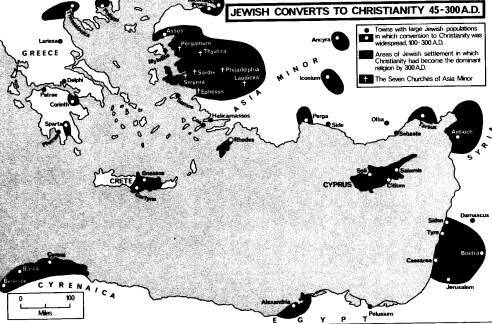 A steady stream of Israelite conversions to Christianity has occurred throughout the church age, and is a major reason that Jews by the 20th century numbered only about 14 million. Bible prophecy in the unconditional Abrahamic Covenant guaranteed that Israel would be as the sand of the sea shore for multitude (Genesis 17), and a thousand times their half to three-quarter million number at the time of the Exodus. Certainly the present few Jewish religious adherents do not constitute all of the physical descendants of Israel in the world today. Funk & Wagnalls Jewish Encyclopedia relates an incident of an entire Jewish region of Europe converting to Christianity in the Middle Ages. (IX:644) Similarly, the Universal Jewish Encyclopedia speaks of the rising tide of conversion of Jews to Christianity in the 18th century. (V:641) In addition to conversions, intermarriages between Jews and Christians have been increasing to the point that a study cited in the Detroit News (8-25-97, 4B) states, intermarriage... is running above 50 percent in the whole Jewish community. According to polls conducted by several organizations, most mainstream Jews indicated that they would be more upset if their children brought home devout Orthodox Jews as marriage partners than if they brought home Christians. Jewish author Alan Dershowitz has documented that the rate of Jewish intermarriage is increasing, and if other cases are any guide, his own grandchildren will not be raised as Jews. Should we ignore the multitude of Israelites who are now a part of the Christian world? Perhaps it could be said that many Israelites who did not convert to Christ through evangelism have seen their children converted through intermarriages. Through one method or the other, multitudes of true Israel have indeed been converted to Christ in this age. Despite the popular teaching that Israel rejected their Savior, some Dispensationalist scholars readily admit that large numbers of Israelites believed and followed Jesus Christ. A Dispensational Theology, by Charles F. Baker, President Emeritus of Grace Bible College, states, Paul was an Israelite in the flesh, and many such Israelites were saved. (p. 528) This is in accord with the evidence we have provided from many sources. Yet later on the very same page he remarks, The fulfillment [of the Kingdom] was doubtless conditioned upon Israels acceptance of their Messiah. Because Israel rejected... The contradiction is obvious here. If many Israelites became Christian, how was the kingdom refused? The incorrect rationale used is that an Israelite national rejection occurred due to her leaders rejection of Christ. Not so! Here is a key point in understanding the fulfillment of prophecy: The common peoples acceptance of Christ, and their leaders rejection of Him, are actually two separate prophetic issues which should not be combined and confused. Indeed, Bible prophecy clearly foretold both that the religious leaders would slay Christ, and also that many Israelites would accept Him. he is brought as a lamb to the slaughter. (Isa 53:3-7) If the Romans, or any other nation on earth, had slain the Son of God, the Old Covenant prophetic type of Hebrew priests slaying the lamb would not have been fulfilled. Therefore, Pilat had to state, I am innocent of the blood of this just person: see ye to it. (Matt 27:24) In fact, when caught up in the crowd frenzy, shouting His blood be on us, and on our children (Matt. 27:25), the people were helping fulfill prophecy concerning the Messiah as sacrificial lamb. Their timeless vow testified in a positive way that the blood of Christ did indeed cover our sins, and not for ours only, but also for the sins of the whole world. (1John 2:2) The Apostle Paul said that, their offense [slaying Christ] is salvation to the nations. (Rom. 11:11, Concordant) Therefore the priests, the religious leaders, had to oppose Christ and perform their sacrificial duties upon Him. This was very amply foretold by the prophets. But a second prophetic cross-current was foretold, as well. Israel was called Gods servant people: But thou, Israel, art my servant, Jacob whom I have chosen, the seed of Abraham my friend. (Isa. 41:8; compare Isa. 42:1; 43:10; 44:1-2, 21; 48:20; 49:3, etc.) and told that they shouldest be my servant to raise up the tribes of Jacob, and to restore the preserved of Israel: I will also give thee for a light to the Gentiles, that thou mayest be my salvation unto the end of the earth. (Isa. 49:6). God further promised, Shall I hide from Abraham that thing which I do; Seeing that Abraham shall surely become a great and mighty nation, and all the nations of the earth shall be blessed in him? For I know him, that he will command his children and his household after him, and they shall keep the way of the LORD, to do justice and judgment; that the LORD may bring upon Abraham that which he hath spoken of him. (Gen. 18:17-19) It is popular today to accuse the prophets of having defective vision concerning latter-day Israel and the church age, but this is God speaking! Let us put far from us the notion that God Himself did not know whereof He spoke. Israel, God said, would keep the way of the Lord, and all the nations of the earth would be (materially and spiritually) blessed in him. New Testament fulfillment in the Book of Acts indicates that the Old Testament prophecies were true and that Israel was indeed fulfilling her servanthood role. Israel became Gods servant, evangelist, and blessing to the whole world! Our separate study, The Hebrew Foundation Of Christs Church, takes an in-depth look at Israels central role in the New Testament Church. God, through the Prophet Jeremiah, further declared that He would give Israel pastors according to mine heart, which shall feed you with knowledge and understanding. (Jer. 3:14-17). This was a prophecy of redeemed Israel entering Zion, and was quoted by Pastor John Robinson (1575-1625), minister to the Pilgrims, at the time they set sail for America. Pray that those remaining among Israel who still do not know their Messiah and Redeemer will soon believe in Him, for that time will surely come. And so all Israel shall be saved: as it is written, There shall come out of Sion the Deliverer, and shall turn away ungodliness from Jacob: For this is my covenant unto them, when I shall take away their sins. (Rom 11:26-27) Amen!